Shenandoah National Park is an ideal getaway destination from the Washington, DC area: It's just a 75-minute drive west of the nation's capital. Visitors enjoy a wide range of recreational activities amid breathtaking scenery in the beautiful Blue Ridge Mountains of Virginia. The region is most known for its spectacular panoramic views along Skyline Drive, a 105-mile road that winds through the entire length of the park. Shenandoah National Park covers 200,000 acres of scenic countryside traversed by more than 500 miles of trails, including 101 miles of the Appalachian Trail. If you are planning a trip to Shenandoah National Park from the Washington area, you should keep in mind that the park stretches over 200 miles in distance, so it will take you longer than 75 minutes to get to some of the popular attractions. Winchester and Front Royal are on the northern end of the park and are closest to Washington. Luray, Skyland, and Big Meadows are in the center, and Waynesboro is at the southern end of Shenandoah National Park. Shenandoah National Park offers a bounty of things to do outdoors in one of the most scenic areas of the United States. Hiking and nature walks: Guided hikes are available throughout the year. Stop at a visitor center to pick up a schedule and register for ranger-guided hikes. Dickey Ridge Visitor Center is located at Mile 4.6, and Harry F. Byrd Sr. Visitor Center is at Milepost 51 on Skyline Drive. Horseback riding: There are more than 150 miles of horse trails in the park. Guided trail rides are available from April through early November and depart from the stable at Skyland Resort at Milepost 41.7. Riders must be at least 4 feet 10 inches tall. Pony rides are also available for children. Wildlife and nature photography: Shenandoah National Park's spectacular scenery gives you tons of photo ops. Forests, waterfalls, birds, and white-tailed deer make dramatic subjects throughout the seasons. Fishing: A Virginia fishing license is required and may be obtained at Big Meadows Wayside at Milepost 51.2. There are limitations on fishing in some areas, so check the regulations before casting a line. Bicycling: You may ride a bike along Skyline Drive and on paved areas in the park. Bicycling is not allowed on trails, unpaved roads, or in grassy areas. Since the roads are steep with many blind curves, park officials do not encourage bicycling. Water sports: You may swim in any river at your own risk. Canoeing, kayaking, tubing, and rafting trips can be arranged through private outfitters. Contact Downriver Canoe Co. or Shenandoah River Outfitters for activities on the water. Evening campfire programs: Special evening programs are available from June through October. Junior Ranger programs: Special educational programs are available for kids ages 7 through 12 during the summer months. If you can't get enough outdoor recreation at Shenandoah National Park, there are several interesting attractions in the Shenandoah Valley. Also of interest are a couple historic spots not far from the park. George Washington and Jefferson National Forests: George Washington and Jefferson National Forests extend through the Blue Ridge and Southern Appalachian mountains. Enjoy hiking, camping, bicycling, hunting, and fishing in these preserves. Luray Caverns: Luray Caverns are the largest caverns in the eastern United States and one of the most popular attractions in the Shenandoah Valley. Explore this natural wonder with towering stone columns, mudflows, stalactites, stalagmites, and crystal-clear pools. Also at Luray Caverns, visit the Car & Carriage Caravan Museum and experience the history of transportation. Here you'll see more than 140 cars, carriages, coaches, and costumes from 1725. Shenandoah Caverns: These caverns are also beautiful and may be easier to get to and less crowded than Luray. Shenandoah Caverns are located just a few minutes off of I-81. Also on-site is American Celebration on Parade!, a colorful display of parade floats from the Rose Parade, presidential inaugurals, and Thanksgiving parades. Shenandoah Vineyards: This is the oldest winery in the Shenandoah Valley. Tour the 26-acre vineyard and sample a variety of wines. The vineyards are open daily from March through November. New Market Battlefield Park and Military Museum: Explore this 300-acre historic park and museum in historic New Market, Virginia, with scenic Shenandoah River overlooks, picnic spots, and walking trails. It is open daily year-round. Old Town Winchester: The historic district has many restored Federalist-style structures, charming shops, unique restaurants, museums, and landmarks. 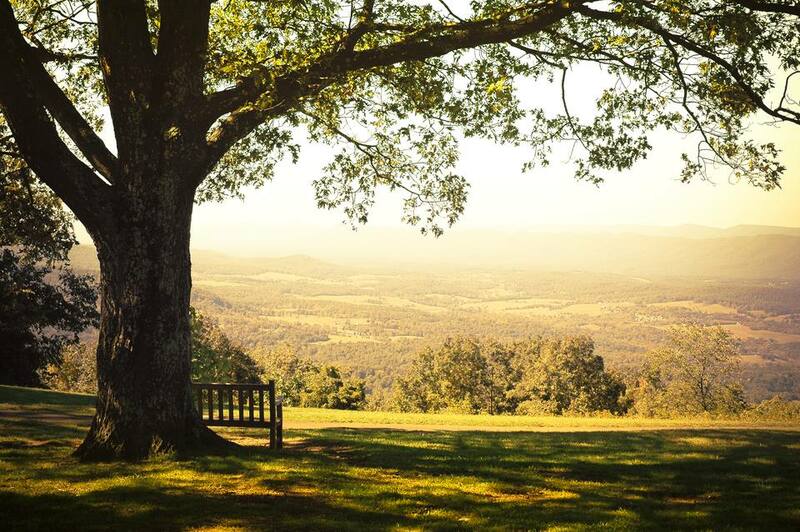 There is a wide variety of accommodations near Shenandoah National Park. You can stay at one of the park's historic lodges or fully experience the beautiful natural surroundings sleeping in a cabin or under the stars at a campground. Reservations are suggested, and backcountry camping is allowed with a permit. Skyland Resort: Shenandoah National Park's largest lodge is located at the highest point on Skyline Drive at 3,680 feet. Accommodations include 178 units ranging from historic cabins to modern hotel rooms and suites. The resort includes a dining room, family-friendly entertainment, ranger-guided programs, horseback riding, and a conference hall. Big Meadows Lodge: Big Meadows Lodge is a smaller lodge in Shenandoah National Park with just 25 rooms and 72 cabins, suites, and traditional rooms. The lodge has a dining room, family-friendly entertainment, guided ranger programs, and a visitor center nearby. Lewis Mountain Cabins: Enjoy the fun of camping in Shenandoah National Park with private bathrooms, heat, electric lights, towels, and linens in one of 10 historic cabins with an outdoor cooking and recreation area and a camp store. Mathews Arm Campground: Its 179 campsites are near the trail to Overall Run Falls, the tallest waterfall in the park. Big Meadows Campground: Three waterfalls are within walking distance of its 217 campsites. Lewis Mountain Campground: With just 31 campsites, this is the smallest campground in the park. Loft Mountain Campground: These 219 campsites offer spectacular views and have two waterfalls nearby. Dundo Group Campground: This campground with seven campsites is specifically for groups of eight to 20 people. If you like your lodging to have a bit more in the way of civilization and luxury accouterments, the place for you to stay is in a resort or hotel. Bryce Resort: This four-season family-friendly resort, about two hours from Washington in Basye, Virginia, is a destination in itself, with a wide range of activities such as skiing, golf, swimming, and hiking. The Omni Homestead: This luxury resort is located in Virginia's Allegheny Mountains in Hot Springs is ranked among the world's finest golf and spa resorts. Activities include hiking, biking, fishing, horseback riding, and canoeing. Massanutten Resort: This is a huge four-season resort, also located about two hours from Washington in Massanutten, Virginia, has several lodging choices and a wide selection of activities. Luray Days Inn: This hotel is seven miles from Shenandoah National Park. New Market Days Inn Battlefield: This modern hotel is set on a historic battlefield about 11 miles from Shenandoah National Park. Quality Inn Shenandoah Valley: This hotel is about 11 miles from Shenandoah National Park. Hampton Inn: This hotel is conveniently located at the entrance to Skyline Drive in Front Royal, Virginia.